In the centre of this attractive seafaring city you will find the Parador of Ferrol. 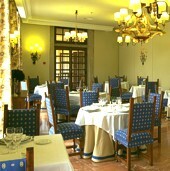 It recreates an image with the essence of a Galician mansion possessing glazed galleries and a specific marine setting. The interior decoration displays nautical elements, world maps, and navigational instruments. The main staircase has an ancient lamp taken from a boat and maritime motifs are abundant in the living rooms. The bedrooms are spacious, displaying colors of ochre and darker shades. Some of the rooms have viewpoints and balconies enabling you to enjoy magnificent views over the port. "Sopa ferrolana" being a local seafood soup; The soup is listed last because the local custom is for soup to be served at the end of the meal. In addition food is usually served warm and only hot if specially requested. The restaurant has a special menu for those requiring a gluten free diet. Go for a walk in the old part of the town (Magdalena neighbourhood), where you can visit the church of San Francisco. Other monuments of interest are the Cathedral of San Julian and San Felipe castle. Outside of Ferrol there is the church of Chanteiro, the Monasteries of Monfero and Caveiro, and the village of Pontedeume. See the local celebrations: the feasts of San Julian, the patron saint of the city held on January 8th; Nuestra Senora de Chamorro (Easter Monday); and the Feasts of Amboage in August. The beaches of Doninos, Cobas and Valdovino are ideal places for swimming and windsurfing. The Natural Park of Fragas do Eume offer many walks or on a mountain bike! Other activities in the area are golf and rowing. 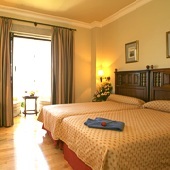 The Ferrol Parador has twenty four twin bedded rooms, five rooms with a double bed, five single rooms, one suite and one easy access room. All the rooms have a private bathroom and there is a telephone, television, TV canal plus, safe and a mini bar. The Parador Ferrol has air conditioning, central heating, currency exchange, lift, satellite television, gift shop, restaurant and bar. 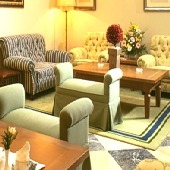 There are facilities to hold meetings at the hotel. Distance from the nearest airport is approximately 50 kms, train station is 0.5 kms away and the nearest port is 0.3 kms away. We arrived on Friday 18th May 2012. The man on reception was'nt very welcoming. The room was lovely and the view interesting. The restaurant was superb and the staff courteous and helpful in delightful contrast to the man on reception. All in all we enjoyed our stay and would come again. Our arrival in September 2011 was dealt with courteously and efficiently, up to the standard we were to get used to over the following week at 4 other Paradores. Our room was very comfortable, quiet, large, beautifully furnished and with a fabulous bathroom. The view from our room was interesting if not spectacular. The very obliging staff prepared a superb meal late into the evening and were very helpful in guiding us through the menu which was welcome after a long tiring journey. And such a lovely restaurant. We enjoyed our stay, even though it was a short one. The only slight blot was the member of staff who dealt with our departure, who seemed to feel we were a distraction from whatever it was he would prefer to be doing. In fact that was the only blot on all 9 nights we spent at Paradores. La vista desde nuestra habitacion era muy pacifica y agradable. Las gaviotas gritaban y los barcon mecian en el agua. La habitacion era un poco oscura pero acogedora justamente porque no me encontraba muy bien. El servicio durante la cena no nos gustaba: la camarera nos trataba sin interes y con mucha prisa. El desayuno nos gusto mucho mas. Ferrol no tiene nada que visitar pero el parador es apacible. 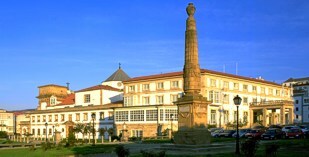 Parador de Ferrol is a manor house hotel with view of the port and Ria of Ferrol.